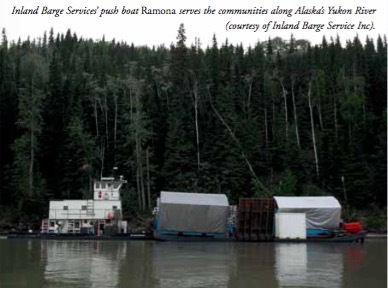 After nine years of operation in the harsh, abrasive waters of Alaska’s Yukon River, aboard Inland Barge Service’s push boat Ramona,Thordon Bearings’ RiverTough water-lubricated tail-shaft bearing system has emerged completely free of wear and tear. The exceptional performance of the RiverTough bearings in waters renowned for their high content of gritty glacial silt came to light when the 16m (52.5ft) workboat’s cracked struts underwent repair in dry-dock. Charles Hnilicka, the owner of Inland Barge Service Inc, said: “In the spring of 2011 we were doing some hot work on one of the struts and decided to change the bearing since everything was apart. We didn’t have to and could have reinstalled the original bearing after the hot work, but we had a spare set. The 1971-built push boat provides an invaluable service delivering freight and consumer goods to communities along the Yukon River and its tributaries. These shallow waters, usually only navigable between May and October, are fed by rain and glacial melt containing highly abrasive silt and ground rocks, called glacial till, that can severely damage other propeller shaft systems. Since 2003, when Inland Barges Services replaced the single-screw Ramona’s rubber bearings,Thordon’s polymer system has undertaken over 2000 hours of operation per year in some very abrasive environments. Todd Terry, President of Pacific Marine Equipment (PME),Thordon Bearings’ Seattle-based distributor, said Inland Barge Service, Inc is among a growing number of workboat and small craft operators to covert from rubber tail-shaft bearings to the RiverTough solution. McAsphalt Marine Transportation is the latest owner to opt for the RiverTough solution and Thordon Bearings will supply water-lubricated bearings and Nickel Chrome Boron- coated stainless steel liners for a twin- screw articulated push barge operating in the Great Lakes waterway system. The bearings will be designed for 365mm (14.4”) shaft diameters.